LG’s upcoming slate will be a worthy challenger to Google’s popular Nexus 7. Back in July, Google launched the new Nexus 7 tablet, shaving two millimeters and 50 grams from its predecessor, while adding a rear-facing camera and a high definition display. The updated Nexus 7 gained positive reviews from critics and has arguably become the most popular alternative to Apple’s iPad Mini. However, a challenger approaches in the form of LG’s new 8.3-inch G Pad. Though slightly larger than the Nexus 7, both are formidable small-sized Android tablets that are sure to increase in popularity as the holiday shopping season approaches. The Nexus 7 measures 7.9 inches tall by 4.5 inches wide and is 0.3 inches thick. It weighs 0.69 pounds and is available in black only. Its upgraded LCD screen packs 1920 x 1200 pixels at 323 PPI. Beneath the high definition display is a Qualcomm Snapdragon S4 Pro CPU clocked at 1.5 GHz. The 2013 Nexus 7 has 2GB of RAM, 16 or 32GB of internal storage, and a 3,950 mAh battery. 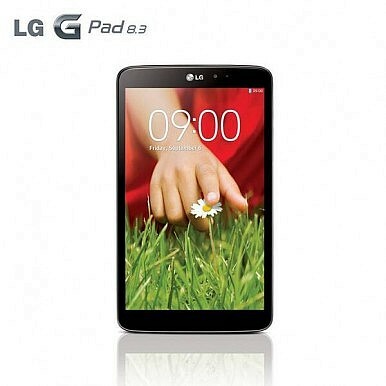 The LG G Pad 8.3 is 8.54 inches tall, 4.98 inches wide, and 0.33 inches thick. It weighs slightly more than the Nexus 7 at 0.75 pounds. It will be offered in both black and white. Its screen is also rated at 1920 x 1200 pixels – but it falls behind with only 273 PPI. Under the G Pad’s hood is a Qualcomm Snapdragon 600 processor clocked at 1.7 GHz. It has 2GB of RAM but only a 16GB internal memory option. However, the memory can be expanded up to 64GB via the microSD slot – something that is missing from the Nexus 7. The G Pad also comes with a larger 4,600 mAh battery. The Nexus 7 has one clear advantage over the G Pad 8.3. It ships with Android 4.3, and being a Nexus device, it will be one of the first tablets to receive updates directly from Google. The G Pad will come with Android 4.2.2 Jelly Bean. The new Nexus 7 posted an AnTuTu benchmark score of 19,131. However, the LG G Pad bested it with a score of 22,512. The G Pad also comes with some interesting software features that aren’t included with the Nexus’ stock version of Android. It shares the same “KnockON” feature as the LG G2, which allows a user to tap the screen to wake up the device. SlideAside allows the G Pad to run three apps at once, giving the user the option to three-finger swipe between them. There is also a very robust smartphone pairing feature called QPair. The 16GB version of the Nexus 7 is a mere $229, but rumors indicate that the G Pad 8.3 will cost only $299. Pricing and a firm release date are still unknown, but it is expected to arrive before the end of September. If the $299 price tag proves to be true, the LG G Pad 8.3 might be a better option for holiday shoppers. It may not be a Nexus device, but its slightly better specs, performance, and additional software make it a worthy challenger to the Nexus 7.